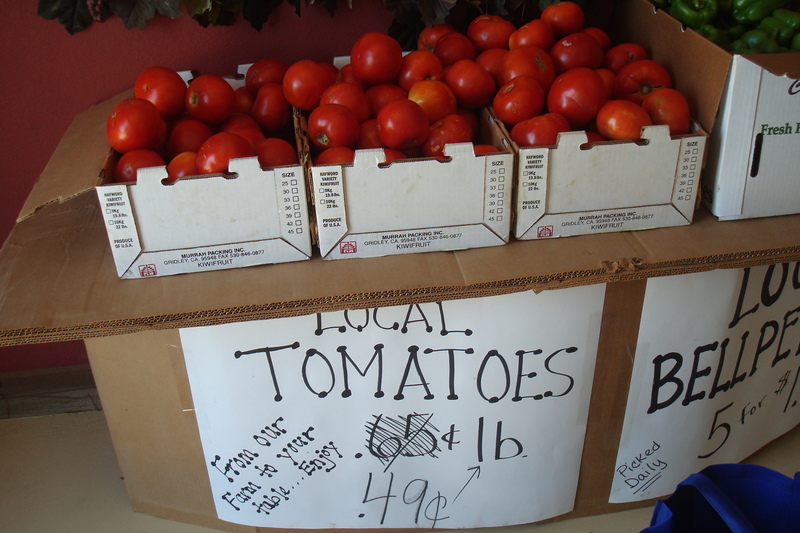 Ripe tomatoes for 49-cents a pound. Local, yes, but obviously not organic. The tedious drive down I-5 from Corvallis to the Bay Area is not one we hope to make again anytime soon, at least not there and back as we did in one weekend. But we had a wedding in Napa, and since our budget and patience have been drained by summer travel, driving seemed preferable to flying. There were bright spots along the way: a satisfying outdoor lunch at The Cottage in Cottage Grove, spectacular views of Mount Shasta and gourmet tacos and agua fresca in Ashland. But the most memorable stop? A nondescript roadside stand on Highway 20 near Sacramento, just before we exited for I-5 N to Redding, and finally, Oregon. We passed it by, but I made Dan turn back. Summer corn, which isn’t quite yet ripe in cooler Corvallis. Melons. Giant Beefsteak tomatoes. I didn’t care if they weren’t organic. At least they were local, grown (perhaps with copious amounts of synthetic fertilizer and fungicides) in the fields that backed up to the stand. In the hot California sun. 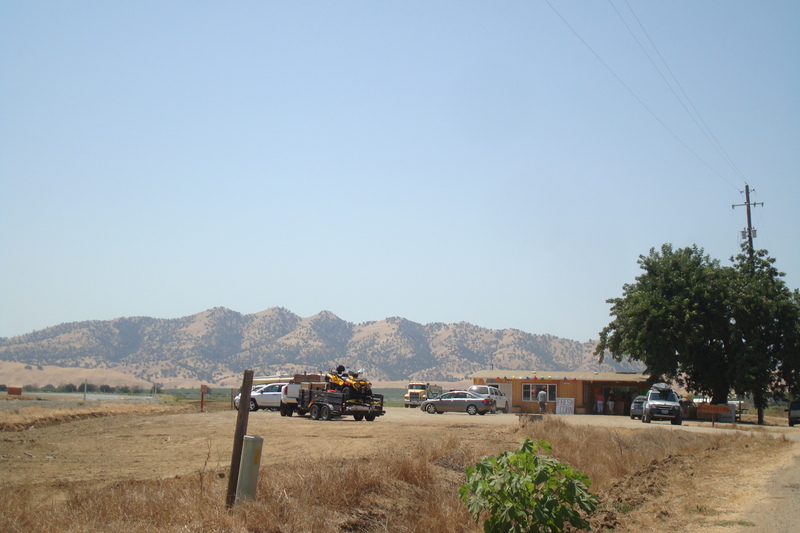 The Charter Family Fruit Stand, on Highway 20 and King Road, just before you exit for I-5 towards Redding. It was Sunday afternoon and packed with customers. They husked ears of sweet corn, sitting in heaps on ice, five for $1. Green bell peppers were five for $1, too. Tomatoes were 49-cents (marked down from 65-cents) a pound. At the farmer’s market, I think I’ve paid up to $3.50 a pound for organic tomatoes. Here, generic orange-fleshed melons were 2 for $1, as were fragrant cantaloupes; large honeydews and mini watermelons were just $1 each. The produce was local, fresh and cheap, and people couldn’t get enough of it. We grew giddy ourselves, coming home with such bounty for less than $10. I’m still committed to organic agriculture, but I choose local over pesticide-free produce shipped in from China or Latin America. And this farm stand makes affordable, healthy produce available to the masses. 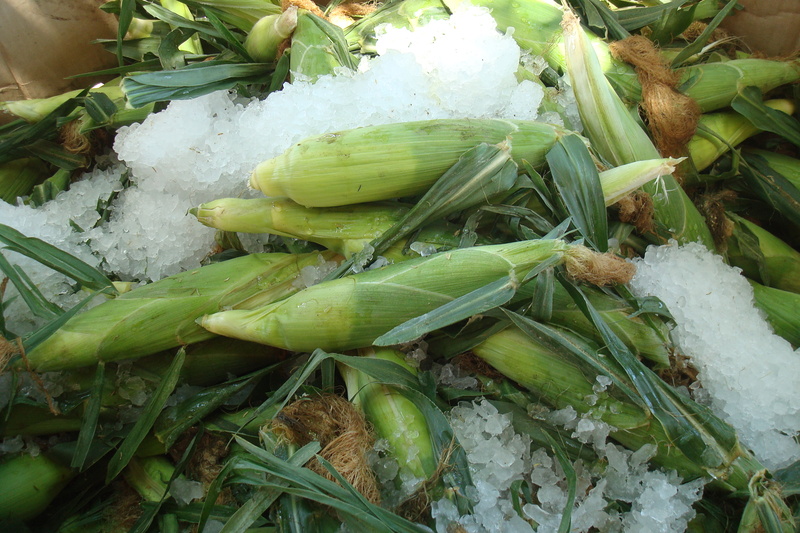 Sweet corn on ice. I'd never seen that before. As we drove home, I planned to make gazpacho and Mexican-style roasted corn with these treasures. I remembered seeing this melon gazpacho recipe, but tonight, didn’t allow enough time to macerate the ingredients in lemon juice. Instead, I turned to Mark Bittman’s far simpler tomato-melon gazpacho. The quick sautee in olive oil really brought out of the flavor of the still unripe orange-fleshed (with a honeydew-like rind) melon we used. I also finally peeled and seeded tomatoes using the proper technique, though I’m still not sure it’s worth the time. Unfortunately, the soup lacked a certain je ne sais quoi. Dan declared it heresy to make gazpacho without garlic, but wouldn’t that overpower the sweet, delicate melon flavor? Maybe it just needed salt. I added a splash of balsamic vinegar to brighten things up. The bright orange soup presented well, at least, garnished with a dollop of yogurt and basil leaves. Anyone have better melon gazpacho recipes to recommend instead? The corn, which we oven-roasted in the husk, was delicious. I still prefer my corn roasted on a proper grill, but we’ve never been big grillers. I’m still dreaming of that magical Mexican corn recipe from last summer. But my mother thinks it’s a crime to slather fattening butter and sour cream onto sweet corn. When it’s really good, she prefers hers without condiments. 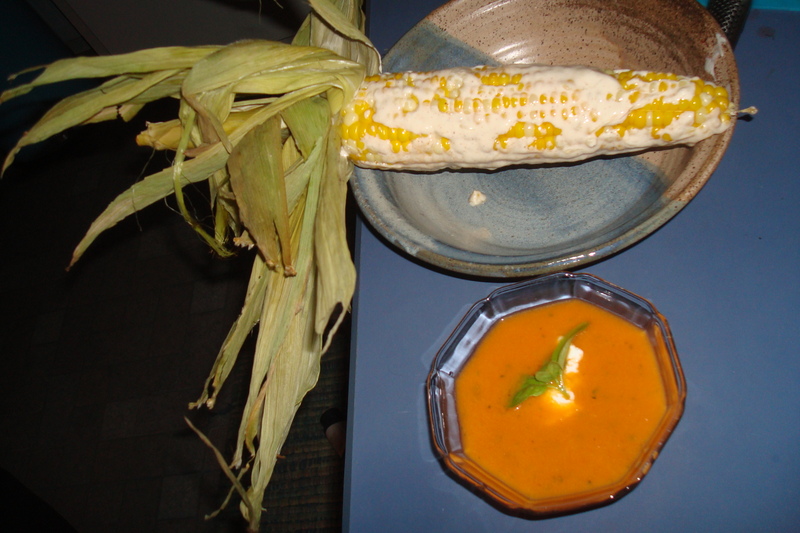 Oven-roasted corn and tomato-melon gazpacho. Maple syrup lends sweetness and chipotle chilies add smoky heat to a terrific glaze for grilled corn on the cob. Prepare barbecue (medium heat). Brush corn with some of glaze. Grill until lightly charred in spots, turning frequently, about 8 minutes. Transfer corn to platter. Brush corn with remaining glaze. Sprinkle generously with salt and serve. The ice keeps the corn sweeter. As soon as it’s picked the sugars start converting to more complex carbs – the ice slows that process down.